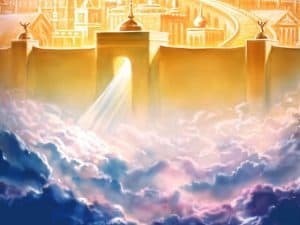 M12D New Jerusalem: What is it? | GOD Who Are You? AND Who Am I? M12D New Jerusalem: What is it? This is New Jerusalem, also known as heaven. This brings us to Chapter 21 in Revelation, the next to last chapter, where an angel showed John the bride, the wife of the Lamb. He was taken to a high mountain where he saw the Holy City, Jerusalem, “coming down out of heaven from God” (verse10), not saying exactly where it landed, but this is how the story ends and eternity begins. John said, “I saw a new heaven and a new earth, for the first heaven and the first earth had passed away, and there was no longer any sea” (Rev. 21:1). This first verse shows a big difference from the millennial Jerusalem where water flowed out to the east and west seas. John describes the dazzling gift Jesus went to heaven to prepare for His wife-to-be—the New Jerusalem: “prepared as a bride beautifully dressed for her husband. And [he] heard a loud voice from the throne saying, ‘Now the dwelling of God is with men, and he will live with them. They will be his people, and God himself will be with them and be their God. He will wipe every tear from their eyes. There will be no more death or mourning or crying or pain, for the old order of things has passed away’” (Rev. 21:2-4). 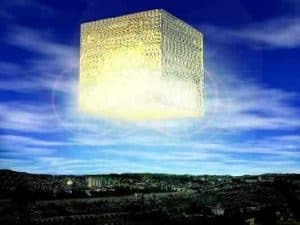 Interestingly, the New Jerusalem John saw was in the shape of a cube measuring approximately 1,400 miles square. Its walls were 144 cubits, 200 feet, thick. Twelve is the signature of God’s people. It had 12 gates, inscribed with the names of the 12 tribes of Israel, and 12 foundations with the names of the 12 apostles. (See Ezek. 48:30-34). This perfect cube, holding salty Christians, placed over the United States of America, would extend from the northernmost tip of Maine to the southernmost tip of Florida and from the east coast westward to the state of Colorado. The same distance of about 1,400 plus miles would extend into the sky. The wall of the New Jerusalem is made of jasper and the city of pure gold—as pure as glass. The great street of the city was pure gold like transparent glass. The twelve foundations of the city walls are decorated with every kind of precious stone—each a different sparkling stone. To top it all off, the twelve gates are each made of one single pearl. Jesus will place the most beautiful, huge, pearl necklace around our neck that will never be matched. The gates will never be shut, for there will be no night. There will be no temple in this city because the LORD is there. “The city does not need the sun or the moon to shine on it, for the glory of God gives it light, and the Lamb is its lamp” (Rev. 21:23). The nations will also walk by its light. The gates of the city will always be open while you and I travel through them. On Jesus’ robe and on His thigh His name is written: KING OF KINGS AND LORD OF LORDS (see Rev. 19:16). You and I are the kings and lords Jesus is King and Lord of. “Do you not know that the saints will judge the world? . . . Do you not know that we will judge angels? How much more the things of this life!” (1 Cor. 6:2-3). This life is only kindergarten to what we have waiting for us, so we must be wise to learn and accept all God has for us now. We are those kings and lords now, having already been raised up with Christ and seated with Him in the heavenly realms in Christ Jesus (see Eph. 2:6). The old Jerusalem, which we still see today, is a source of strife because God’s name is written there. Satan never has and never will like that. We see that strife and turmoil in the number of times the people turned their back on God—as Orpha did—and the number of times God’s Spirit wooed them back to Him. The millennial Jerusalem will be partially transformed—not yet heaven. It can be compared spiritually to Naomi. She held back on completely embracing all God had for her. She saw herself as too old to have a husband, yet it was okay for her daughter-in-law, Ruth. This Christian has one foot in the heavenly kingdom and one foot in the world. Linda S. had a dream of this type Christian. She saw this person straddling a fence with a very sad face. This person has no joy and is in danger of his or her whole body being pulled into Satan’s quicksand. Another example of this type Christian was Lot, Abraham’s nephew, who chose to live near the city of Sodom. When the angels came to destroy Sodom, he and his family were living inside. They would have been destroyed also if Abraham had not interceded for their lives. The New Jerusalem Church, or body of Christ, has grabbed hold of all God’s promises and claimed them personally. They fulfill what the Lord’s Prayer means—Your kingdom come, Your will be done on earth as it is in heaven (see Matt. 6:10). Before we, as the bridal company, can be raptured we must go to New Jerusalem spiritually and live there now—bringing heaven to Earth. This is no different than when Abraham and Sarah left all to follow the call of God on their lives by following His voice to Canaan. They had to go there physically before they could birth the new land and new nation—before their descendants could take possession. Hagar represents the law of the Old Testament. The new Christians had found freedom in Jesus Christ, but false teachers tried to get them to feel they had to do certain things to please the Lord, or to obtain salvation. This breeds a slavery mindset. This is striving to do things in our own strength, just as Ishmael was born of natural means—what could be humanly controlled—not a supernatural occurrence. Those living with a slavery mindset take no personal responsibility to the Christ who set them free (see Gal. 5:1). Their actions are dictated by what others think and tell them to do. This mindset also means being a slave to pleasures, never looking to anything outside of self or beyond self-gratification in what can be seen, felt or touched. In contrast, Isaac was born through supernatural circumstances—Abraham and Sarah both past the time for child bearing. This represents the Jerusalem that is from above and free. Entering into the New Jerusalem is supernaturally experiencing God, bringing heaven to Earth in our carnal circumstances. This will not happen until we come to the end of self, knowing that if God does not do it, nothing will happen at all. Some people refer to this level of spiritual attainment as the “anointing.” What it means is that the Lord works with us and confirms His Word by the signs that accompany it (see Mark 16:20). Why? Because we are now partners in ministry with God. As the coming of the Lord approaches, we see more and more that we are living in a combat zone between the forces of heaven and hell. Satan, because he knows his time is short, has deployed all his demon forces upon us all. We must remember that God’s grace is greater than all the devil can bring against us (see Rom. 5:20). Satan, the deceiver, is himself deceived. He thinks he is in control, but he is wrong. “The one who is in you is greater than the one who is in the world” (1 John 4:4). And when we think the problem is another person, we must know that “our struggle is not with flesh and blood, but against the rulers, against the authorities, against the powers of this dark world and against the spiritual forces of evil in the heavenly realms” (Eph. 6:12). We must know there is nothing that can come against us that cannot be overcome, because we are already legally on the throne with Jesus. Satan is only the force God has chosen to use to train us in reigning. Therefore, we must learn to fight with a supernatural ability that comes, not only through praise and worship, but in waiting upon and allowing Jehovah God to do His work through us until the time He chooses to bring us home. For those who have ears to hear, eyes to see and a mouth to speak the things of the Lord, heaven will be brought to Earth and souls will be snatched from hell’s waiting room. This also means we need to keep an open mind and heart to visitations of the Lord, because they are THERE. Tim LaHaye, How to Study Bible Prophecy for Yourself, (Harvest House Publishers, Eugene, Oregon, 1990) p. 94-95. Henry Hampton Halley, Halley’s Bible Handbook, (Zondervan Publishing House, 2000), p. 966. Previous PostM12C Jerusalem TransformedNext PostM12E We Are Going Home: Who are you bringing?